​It is said that in the Pure Land of Buddha Amitabha, the water of the ponds bears eight fine qualities or healing qualities. Some qualities can be replaced with other such as relieving the thirst, nourishing the senses or quenching hunger. Maybe because I prepared the blue color for the water while I was thinking about these qualities, it has become a bit too,,,flashy? It's also because the green color I used for the lotus leaves is very very low saturation. I'm hoping it'll be fine as I'm going to use much more strong color later on. After all, the tone or saturation of the color which we recognize is very much depend on the comparison with other colors. We have been to Granada, about 2 hours by car from Mijas. 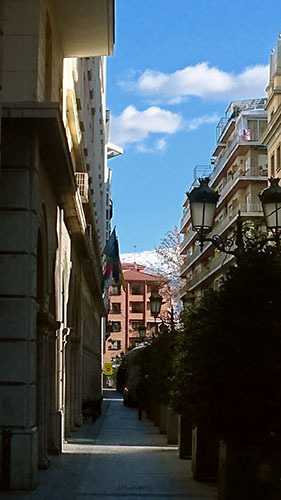 The view of Sirra Nevada between the buildings in the city of Granada remind me Nepal. It was a short trip but we enjoyed very much. After fully enjoyed beautiful city, nice people and nice food in Granada, now let's start to work. I need to start with re-preparing the colors as I haven't painted since sometimes. 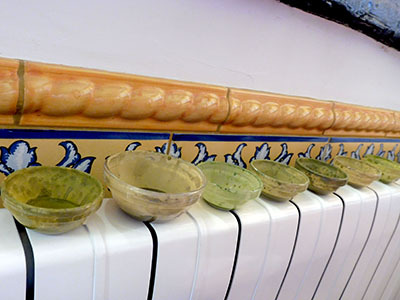 I made several green last time and they are now totally dried and harden in the small pots. There are 7 different green and they looks all same when it's dried...Just as Indian say "Same same but different"
No choice but to prepare all the collor to check. 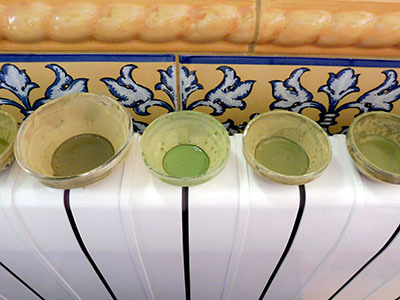 During the winter I usually place the color pots on the heater beside me while I'm working to avoid gelling. I have never seen and tried but feces of goat is said to be the best for this in Tibet. Thank you for this beautiful image!! 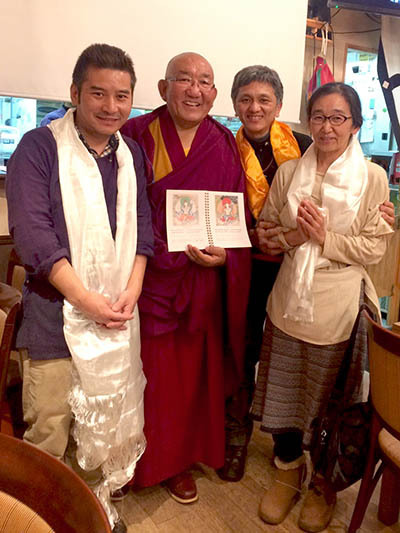 Arjia rinpoche in the restaurant "TASHI DELEK", Tokyo JAPAN. 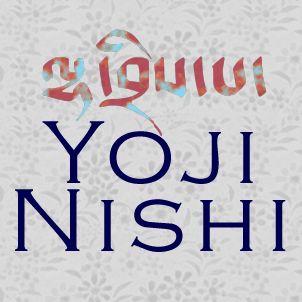 English and French version coming soon!! I have been quite busy and not able to settle down front of the canvas just to paint. 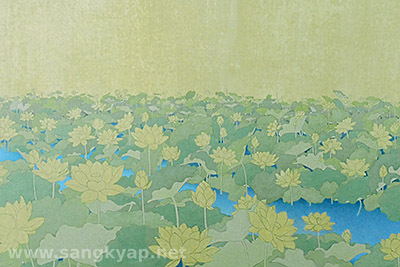 As for the painting of lotus pond, I have managed to paint most part of the lotus leaves. Mixing the color for the leaves took me a lot of time. I couldn't find good green color maybe because the canvas this time is much more yellowish than usual. I started to paint the leaves with two transparent color. 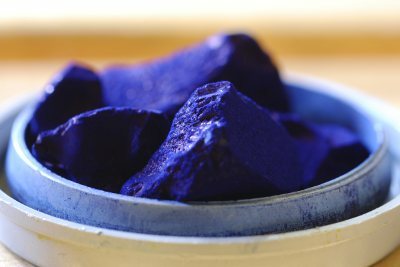 Indigo and Gamboge as originally planned but then when it was almost done I found it was too light,,, or weak. I don't want this part to have strong saturation but still wanted little more solid impression. I changed the plan and decided to use some of earth pigment. Different ochre and green earth together with Indigo and Gamboge. The images below are when I finished linning. 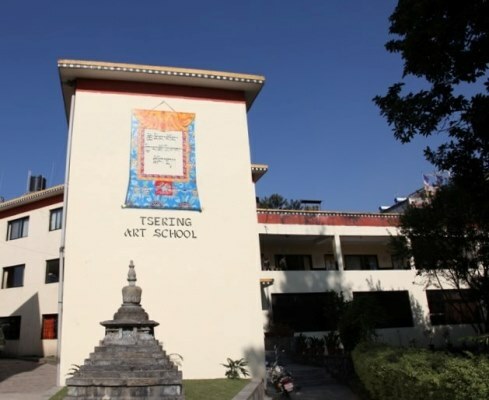 You can learn not only the technique of the Thangka painting but also the history or teaching of the Buddhism and Thangka paintng, Tibetan and Lantsa script, and detail of Mandalas at Tsering art school in Nepal, where I learned Thangka painting. 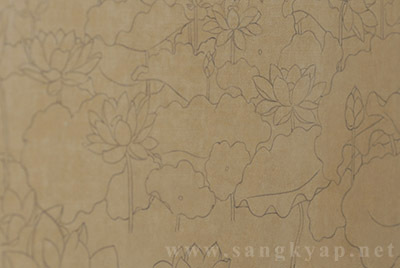 These are important knowledge one should know as a Thangka painter. Thangka painting has been a good souvenir from Nepal for tourists since long time and we can find a lot of Thangka factories around the tourist area. 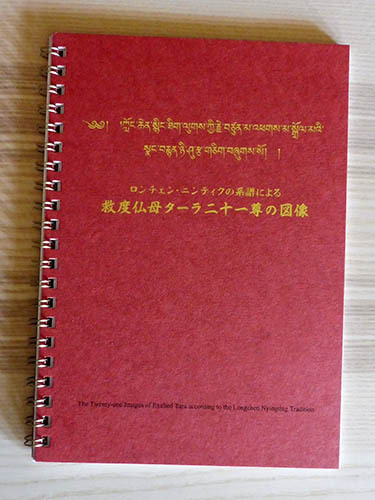 Some of them give the Thangka course to tourists. All these Thangka factories or schools cliam they are authentic or traditional, but unfortunately not all of them. It's rare to find a real good place to learn Thangka painting even in Nepal. 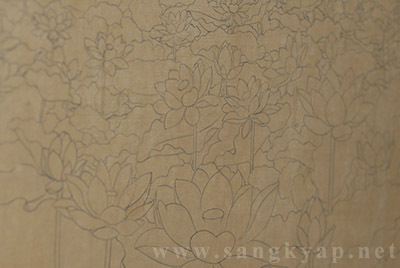 The beautiful shading, called "Dang" in Tibetan, is one of the special feature of Thangka painting. 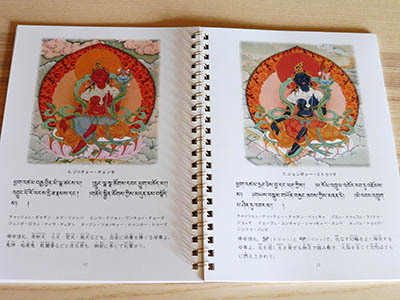 While most of the color for Thangka are from minerals and they are "opaque color", the transparent dye colors are usually used for the shading. There are several different techniques for the shading. To create the sky, mountains, flower and many other part in thangka painting most of thangka painter use "dot" shading or "line" shading. I learnt "dot" shading from my first Thangka teacher Karma-la. Later I learnt "line" shading from Konchog-la. Since I heard from Konchog-la that we don't use dot shading in our lineage I'm using only line shading. Create beautiful gradation with countless of thin short lines. The progress of the work is very slow specially when we do the shading on a big area like sky. The whole work may be wasted if we are not enough careful and made too dark line at the end of the shading where the color are very light. 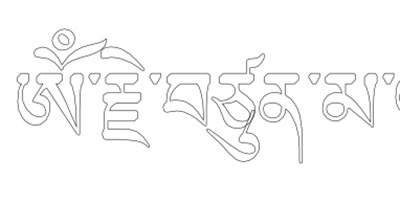 We don't really need great technique to make good shading as we can see this work is usually done by some deciples in Thangka studios but rarely by their master. We need patience. Sitting several hours or several days doing lines, lines and lines even if we feel like it would never finish. If you are not used to it, it is better to think that the shading of the sky may take you about a week to complete so that you won't stress even if it take ONLY some days. 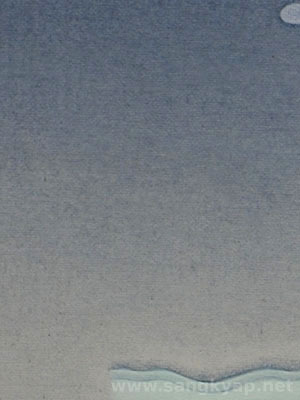 The most used color for shading is Indigo. 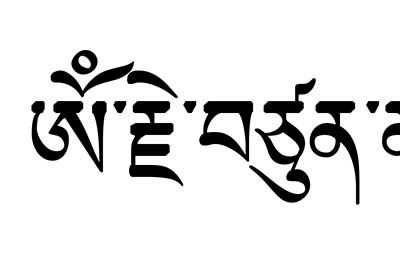 It's called "Ram" in Tibetan. 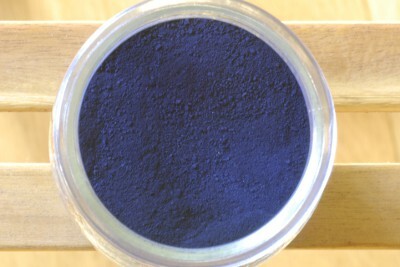 ​The second image above is synthetic indigo which is widely used in Nepal. The internet connection which came back to us alone has left us again even we have done nothing. No way but to use my limited smart phone connection. 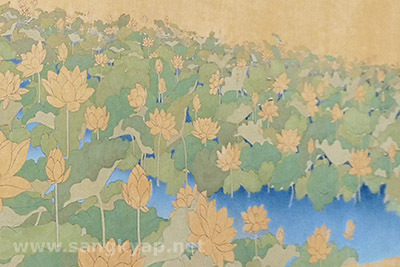 Now I'm working on a new paint which will be filled with a lot of lotus(lotuses?). 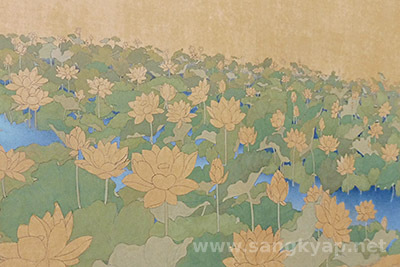 Lotus flower are often,,or almost always depicted in Thangka painting as scenery, offering or design on the deities clothing.